I generally recipe hunt every day, and over the past few days I’ve had a desire for egg salad. 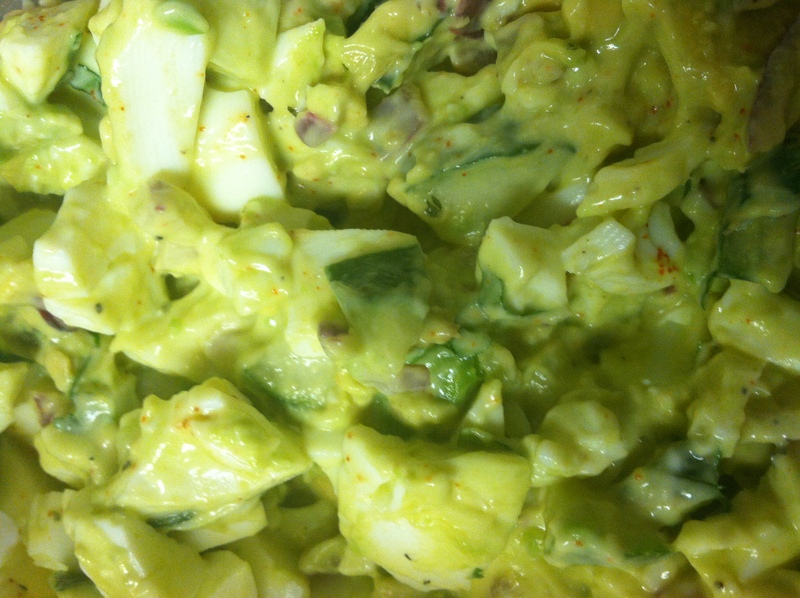 I adapted my recipe from Martha Stewart Egg White and Avocado Salad. I had to tweak it a bit since I don’t like fruit in salads, and I forgot to buy celery. It turned out really well, and I am sure I will be making it more often! Place all ingredients in a large bowl. Gently toss until well combined. Gotta love a good closeup. You could probably use the same general recipe for tuna salad and chicken salad as well. Hey Betisha, Thanks for liking my blog. I like cooking, too! I used to keep an online journal about a long sojourn in MX where I lived for two years a while back. Avocados became a favorite food of mine. I especially liked making avocado bread. If you want the recipe, I can send it to you. That. Sounds. Amazing! Yes, I would love the recipe. Preheat your oven to 350. Grease and flour two 9×5 inch loaf pans. Sift the dry ingredients together. Then, in a medium bowl, cream the sugar and butter until fluffy and then beat in the eggs, dropping them in one at a time. Then mix in the mashed avocado. Stir in the dry ingredients a little at a time, alternating with the sour cream. Add the lime juice and orange zest, chopped pecans and raisins. Pour the mixture into the loaf pans and bake for one hour or until a cake tester inserted in the middle of each loaf comes out clean. Allow the loaves to cool before removing from the pans.